Davenport - It's 1934. We're in a small, poor apartment in Berlin. Two sisters live here, trying to live out their dreams on the threshold of the coming nightmare. Magda (Emily Hinckler) is the actress; charming, confident, "the talk of Berlin." She comes home from the cabaret every night to care for her sister, sharing the glow from a great night's performance. 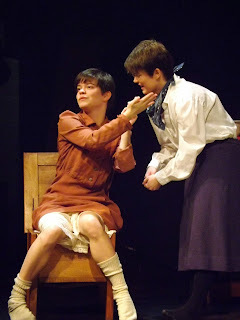 Matilde (Elizabeth Hinckler) has cerebral palsy, and is confined to the home. It is difficult for her to move and speak with the ease and grace of her pretty sister, but it is obvious she is the brains of the operation. Matilde writes the jokes for her sister's act, and though she must miss the show, every night, Magda performs a special reprise before resting her weary head. The only problem is, Matilde's material is getting more and more political, and the cabarets are coming under greater scrutiny as Hitler consolidates his power. What starts off as urbane joking about lesbians in pantsuits becomes nervous dialogue about the party's policy on "incurable" genetic disorders, which, given Matilde's condition, hits dangerously close to home. It is in this dark and dreadful period of history that Janet Schlapkohl's new drama plays out, a story which, for all its terror and tragedy, has a good deal of warmth and humor. My Sister does as wonderful a job portraying the courage of the human spirit as it does the perils of mindless conformity. There is a general feel of tension and danger in the air of the sisters' humble dwelling, and as they debate current events it becomes clear that there is a growing division in their feelings about their country. Matilde, the sardonic, bitter scribbler, spends her days listening to foreign radio and dreaming up vulgar satires. She sees exactly where her country is going, and she wants to take a stand, but she's dependent on her sister, and not just for dressing and using the toilet: Magda is her voice. The more mobile sister loves being the center of attention, and is happy to oblige, but the question of censorship begins to drive a wedge between the pair. When a joke about Hitler's pimmel goes a step too far, tempers flare, and while Berlin burns outside, two young women who love each other very much suddenly find each other unrecognizable. Both Hinckler sisters are incredible actors, and their expertise in crafting character shows in these two very different siblings. 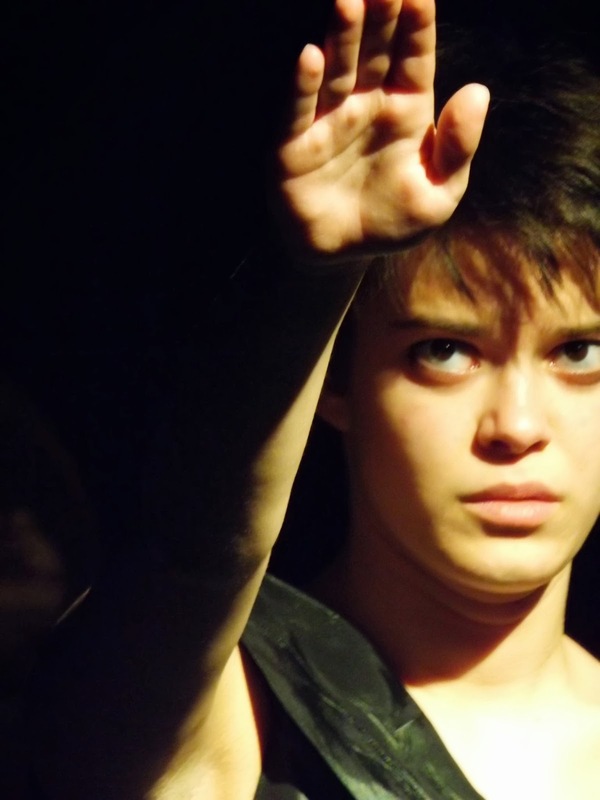 Elizabeth uses some very specific physical and vocal work to bring Matilde's disability to life. What's most impressive is the consistency with which she restricts her movements, while still making the objective work clear. The difficulty in diction does nothing to diminish Matilde's ferocious intelligence; indeed, the struggle to express herself only makes her spirit shine brighter. Emily Hinckler portrays not only Magda, but, through the course of their conversation, other characters in the play. At times she is a scolding mother, at others a suspicious landlord, and she shows great flexibility as she shifts through these roles. Not only her virtuosity but her sensitivity shines through in this performance. It would be easy to write Magda off as foolish and naive, a thoughtless follower, but it's not that simple; we see in her a woman who truly cares about her sister, truly cares about everyone, but is overwhelmed by how quickly and irreparably her world is shattering around her. The Hincklers, guided through the piece by Maria Vorhis' thoughtful direction, are very in tune with each other and with the script. Their timing is impeccable; they seem to have an uncanny connection, and action flows very smoothly, drawing the audience in as the conflict gets more and more intense. Vorhis makes some excellent staging choices to highlight some key character moments, and both actors commit to and fully inhabit the characters. It's an absorbing play, from beginning to end. Janet Schlapkohl's script, which runs about an hour and a half in one act, is a poetic, compelling, and highly emotional piece. It's also very thought-provoking in that there are no easy answers. Both characters' positions are understandable and unreasonable at different moments, and the themes seem to revolve around not who is wrong or who is right, but what we can do, if anything, to stand against the tide of history. While the piece starts off a bit slowly, and the first scene seems a touch long, the exposition in general is handled very well. It's refreshing in that it trusts the audience to know what's going on in the background, and centers the action on the decisions the characters must make about their own lives. As the characters develop, a bigger picture is painted, and the sense of dread and danger grows steadily into its inevitable conclusion. My Sister started life at the University of Iowa in a workshop production; it moved from there to Riverside theatre before coming to the Quad City Theatre Workshop. It closed this weekend; but you probably haven't heard the last of Magda and Matilde; the team is making inquiries about bringing the show to theatres in Chicago. Check www.janetschlapkohl.com for information. Best of luck to them, and kudos on a powerfully penned piece powerfully delivered.